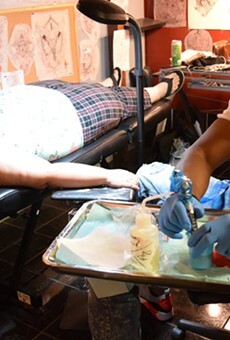 Even the flash art—generic examples of tattoos you can get—on the wall is cool at Black Rose Tattooers. Browse through an artist's portfolio, and the cool goes to a whole new level. Skill is apparent in every design, whether the tattoo is a realistic portrait of a beloved pet, or a custom sleeve that screams with color. Although "scream" is not the best word choice for a tattoo write-up, Black Rose Tattooers know what the heck they're doing. The studio is also bright and clean without being impersonal. The only screaming you're likely to do involves delight over your new artwork.